So I’m getting to the end of my beloved Benefit foundation, and due to, ahem, insufficient funds, it doesn’t look like I’ll be purchasing a new one any time soon. Keen to have perfect skin for my upcoming birthday (March 18th, write it down guys!) I’m saving the last fifth of the bottle til then, so out I went in search of a cheaper bottle to keep me going. Having read a lot of blogs on drugstore foundation, I headed to the shops thinking about either Maybelline’s Fit Me foundation, or Rimmel’s Wake Me Up. I had swatched the Rimmel one previously and really not understood the hype, so I was already leaning towards Maybelline, especially seeing as my Dream Matte Mousse served me so well during my teenage years. At the Maybelline counter I discovered however, that the foundation had been wrongly named, I couldn’t find a shade with the right undertones to suit me, the closest match I had made me somewhat resemble the same shade as an uncooked chicken, classy. So I thought I’d try the Rimmel one again. I picked up the lightest shade, 100 Ivory, and tested it on hand, neck and face, and although not entirely convinced it was worth the hype, decided to go with it. I also picked up the matching concealer and a new Kate Moss lipstick, because, well, I challenge you to find a beauty blogger who can resist a 3 for 2. So I tentatively tried this out using my lovely Body Shop foundation brush, and then my Eco Tools foundation brush, and found myself staring at a strange swirly skinned face in the mirror. In the midst of considering returning it, since streaky face wasn’t exactly what I wanted, I decided to try applying it with my fingers. Thank god I did. I’ve now got this foundation down to a routine of, cover face using fingers, tap on concealer in desired areas, and then using my Real Techniques stippling brush to buff half a pump of foundation over my whole face lightly. The outcome, I actually prefer to my Benefit foundation, at half the price! Despite getting a lot of compliments on my good complexion when wearing my Benefit foundation, a lot of people have actually said that I look healthier wearing this, so it seems the packaging might be right in it’s claims of giving you a ‘healthier, radiant glow’. I’d say this gives me medium coverage before I buff extra on, then you’re looking at full, but natural coverage. It’s got great staying power, even without a primer it will last the day! It’s got a little bit of shimmer to it in the bottle, but that isn’t actually noticable on the skin, I assume that’s all part of the ‘radiant glow effect’! It also has SPF 15 in it, not as much as Benefit’s 25, but let’s face it, the sun rarely comes out in England anyway. I also really like the packaging of this product. It’s an embossed glass bottle with an orange lid, and a pump that dispenses the perfect amount for a whole face. It feels sturdier, and it actually looks more expensive than my poor Benefit’s plastic tube. In terms of the concealer, when I first opened it I thought, ‘clearly I’ve been ripped off here and it’s just a little bit of the foundation in a different bottle’ but actually, I really like it. It’s not great for covering any redness, i.e. if you have a angry looking spot, or I have a little red scar on my cheek, so I won’t be kicking out my MAC Studio Finish any time soon, but it’s great for brightening up around the eyes, or at the side of the nose. And the bonus of it of course is that you buy it in the same shade as the foundation and it blends in impeccably. The only downside I can really think of is the fact that you can only buy this foundation in eight shades, so it’s not going to be for everyone. But for me, this is great! 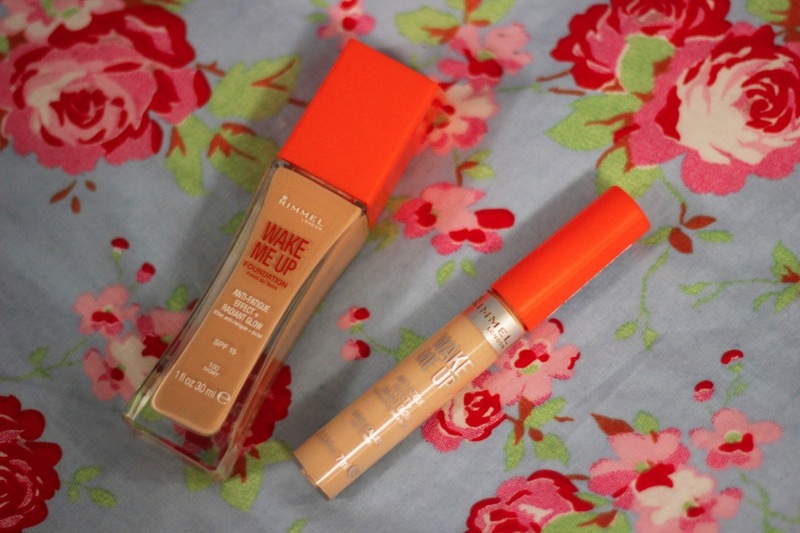 Rimmel Wake Me Up foundation and concealer retail at £8.99, and £4.99 respectively, and are available from, well, everywhere.